Managing the PC lifecycle can be a complicated and expensive process. Organizations with outdated systems require increased support, have higher maintenance costs, and experience a loss of end user productivity. 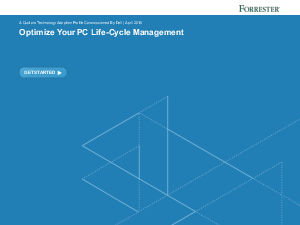 However, Dell commissioned Forrester® Consulting to study the trends and challenges for global IT decision makers in order to identify opportunities for optimizing the PC Lifecycle.Read this report from Dell and Intel® to learn more.